Scientists find how mysterious ‘circular RNA’ is formed, claim muscular dystrophy link. Genetic information is stored in DNA, tiny strands of nucleic acid that contain instructions for the functioning of the human body. To express this genetic data, our DNA is copied into RNA molecules, which then translate the instructions into proteins that perform tasks in cells. Several years ago, scientists discovered a new type of RNA molecule. Unlike all other known RNAs, this molecule is circular, and was labelled circular RNA. Although circRNA molecules are abundant, little has been known about how they are produced. Moreover, little has been known about the role they play in our biology, and next to nothing has been known about the role they play in disease. Now, in an article published in the journal Molecular Cell researchers at the Hebrew University of Jerusalem and the Max Dellbruck Institute have discovered how circRNAs are produced. The team found that circRNAs not only compete with normal RNAs, but the body actually produces them at the expense of normal RNA. Therefore, the mere fact of circRNAs’ production has an enormous impact on how human genes are expressed, which affects how the body develops and functions. The researchers also demonstrated that circular RNA molecules are highly produced in the brain, and in many cases from genes with very important functions. This strongly suggests that circRNAs play an important role in brain function, and likely in brain disease. In addition, the researchers identified the protein ‘muscleblind’ as a factor involved in circRNA biogenesis, and showed that muscleblind can enhance and regulate the production of a subset of circular RNAs. Importantly, defects in muscleblind function are known to cause a severe degenerative disease called myotonic dystrophy. Characterized by progressive muscle wasting and weakness, this is the most common form of muscular dystrophy that begins in adulthood. When considered together, the important role played by muscleblind in regulating circRNAs, combined with these molecules’ abundance in the brain, suggests that circRNAs might be involved in development of myotonic dystrophy. This research is significant from several perspectives. By mapping how circRNAs are produced, it helps advance the medical community’s understanding of general molecular biology. In addition, it might be strongly relevant for understanding and eventually treating degenerative diseases both in muscle and the brain. Circular RNAs (circRNAs) are widely expressed noncoding RNAs. Here, by studying circRNAs in neuronal tissues, we provide evidence that animal circRNAs are generated cotranscriptionally and that their production rate is mainly determined by intronic sequences. We demonstrate that circularization and splicing compete against each other. These mechanisms are tissue specific and conserved in animals. Interestingly, we observed that the second exon of the splicing factor muscleblind (MBL/MBNL1) is circularized in flies and humans. This circRNA (circMbl) and its flanking introns contain conserved muscleblind binding sites, which are strongly and specifically bound by MBL. 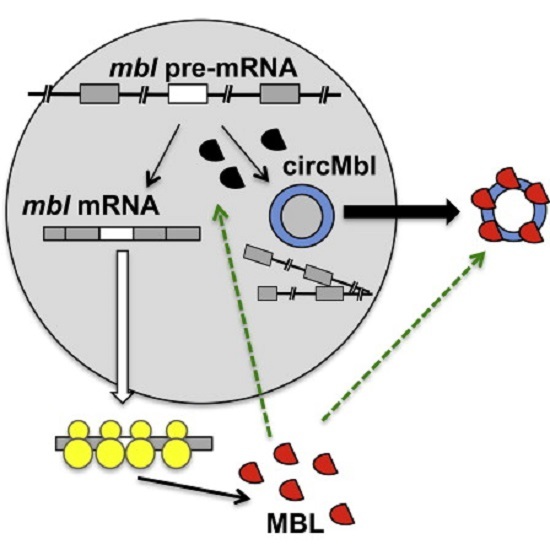 Modulation of MBL levels strongly affects circMbl biosynthesis, and this effect is dependent on the MBL binding sites. Together, our data suggest that circRNAs can function in gene regulation by competing with linear splicing. Furthermore, we identified muscleblind as a factor involved in circRNA biogenesis. Kadener et al 2014. This is a terrific website, could you be interested in doing an interview about just how you produced it? If so e-mail me! Good read, I just passed this onto a colleague who was doing a little research on that. And he just bought me lunch since I found it for him smile So let me rephrase that: Thank you for lunch!